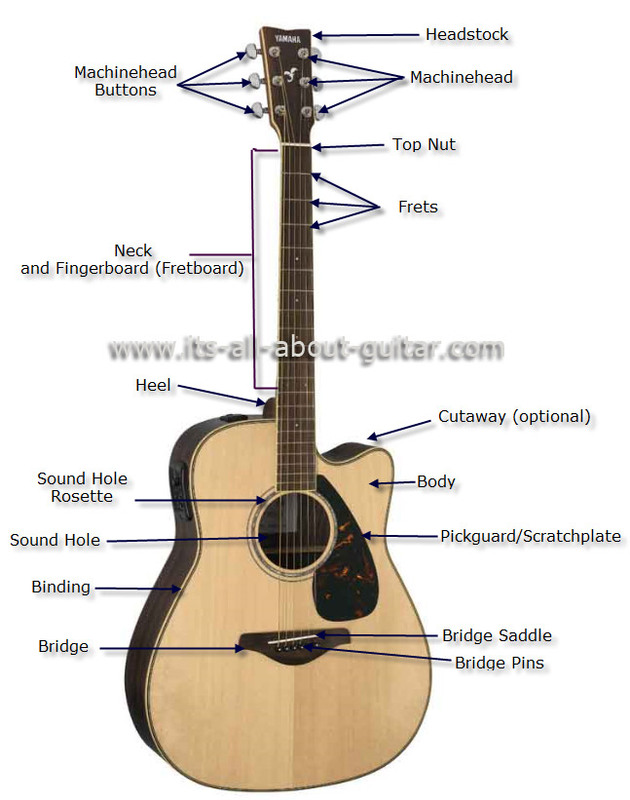 This diagram of an acoustic guitar shows it's main composite parts. This is what is known as either 'Dreadnought', 'Flat Top', 'Jumbo', 'Folk' or 'Country and Western' guitar and has a larger acoustic body than the nylon string acoustic guitar. This gives it a powerful tone and rich resonance. As it is steel strung it needs to of a more robust construction than the Classic or nylon string guitar (due to the increased tension from the steel strings). The 1st and 2nd strings are of plain steel, while the remaining strings are steel, wire wound, normally bronze.